In these times of rapidly changing technology, with increasing amounts of information (which can vary drastically in quality), and trying to keep up with new trends in school librarianship, it is sometimes handy to be reminded that the core business of a school library is literacy. This is exactly what happened at the National Library of New Zealand facilitated School Library Network meeting held in Hawke’s Bay this March. Participants at the network meeting were asked to share an activity or strategy they have used in their schools to promote literacy. This exercise enabled us to be exposed to a number of new ideas, with the challenge to implement at least one of them before we meet again next term. Reading wall – this is an idea I adapted from The Book Whisperer, Donalyn Miller. Instead of using a classroom door to show what I’ve read, what I’m reading, and what I’m going to read, I use the back of the issues computer. The idea is that it promotes discussion with students and they get to see that I’m a reader too. I’ve particularly noticed that our students like to tell me what book I should read next! Reading challenges – every year I set myself a reading challenge. I don’t like to set myself a number target so instead try to be a bit more creative. 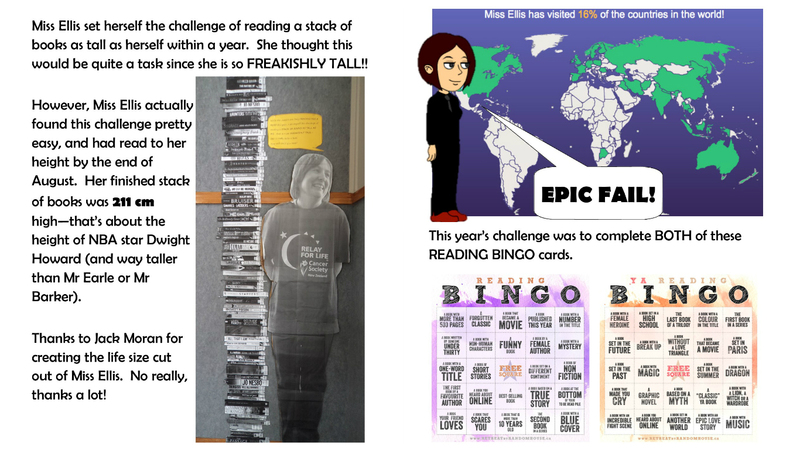 I then display my challenge in the foyer so it is the first thing our community sees when they enter the library. Again this starts lots of conversations (with teachers joining in suggestions on this one) and reminds students that even “good” readers can be challenged. So far I only have a 50% success rate with my challenges, but I think it’s good for students to see that adults can fail at things too. The strategy that I’m going to work on for the next term is our environment. I’ve got some new seating ordered and I’m really looking forward to seeing how that will work in creating some reading corners. I’d also like to give some more bookshop-like promotion a try. What happens in your school library to help promote literacy? I’d love to hear some more ideas! I love your reading challenge and reading wall ideas! I do something similar with our Book Group – I’ve had a few displays now that are books that the Book Group girls are reading (as a way to start discussions and have students recommending books to fellow students), and at our next Book Group meeting we are going to be setting a personal reading challenge, so this gives me some great ideas! Thanks, Carole. I’d love to hear the ideas your girls come up with! For anyone wondering about the value of school libraries – you should read this great article about the ways that school libraries support literacy by our friend Steph Ellis. Thanks for sharing Steph! It’s true – as each new year begins I look forward to what Steph’s latest reading display/challenge is! I now include an additional line in my saved email signature which says, for example, “Currently reading: ‘Unwind’ by Neal Shusterman”. A student saw my sign off once and commented briefly, but more often than not I am contacting parents via this forum. Still, they should be pleased that an English teacher is reading and I guess developing their craft. How else can one judge ideas within student writing if one doesn’t know what plots are cliched vs intriguing? The more examples you read, the better. I digress a little. Simple evidence of reading also works. Amongst papers on my classroom desk are the odd books that I need to return. Those observant or curious students closest to my desk sometimes pick one up. Some even ask me why I have so many post-it notes sticking out. (Everything I read becomes a teachable moment). What about the “blind date” experience? Without revealing a book’s title or author, Steph reads an extract to her captive audience. After a brief recap of books 1, 2, 3,4 and 5, students write their name on a piece of paper and circle the book(s) they’d like to read. Some students circle all of them, some just one and others, none (and that’s okay, too). These are drawn and students are matched with their chosen book to be issued. Thanks for adding this – I’d forgotten I do that!